What does "Cielito Sur" mean? In Spanish, "Cielito" means "little heaven" and "Sur" is South. Cielito Sur is our "Little Heaven in the South". Cielito Sur was purchased by Janet's parents in 1950. It was part of a large coffee farm which was sub-divided into several one hectare lots. Where did the names your rooms come from? The rooms in the Inn are named after some of the Indigenous tribes of Panama. The Ngobe-Bugle is the largest indigenous group and are found in the provinces of Chiriqui, Bocas del Toro and Veraguas. The majority of Kuna Indians live in the San Blas Archipelago (Kuna Yala) located along Panama’s northeast coast. Other groups of Kuna live in scattered settlements in Darien province of Panama and in Colombia. The Embera inhabit, primarily, the Darien rainforest of Panama. This tribe along with the Woonan were formerly known as Choco because they migrated from the Choco province of Colombia in the late 18th century. Both the Embera and the Woonan have a similar river basin culture. Their dress and customs are the same, but their language differs. The Teribe or Naso are located in Bocas del Toro on the banks of the Teribe River, a tributary of the Changuinola River. How far are you from David (capital of the Chiriqui province)? The airport? Paso Canoas (Panama - Costa Rica border)? We are located on the western slope of the Baru Volcano between the towns of Volcan and Cerro Punta. Cielito Sur is about 70 kms from either the David airport or Paso Canoas. It's a one drive from David or Paso Canoas to the Inn. Do you provide transportation to/from the airport or bus terminal? Do you provide other meals? Are there restaurants nearby? A hearty full country-style breakfast is served in our "Casa Tilley" dining room. A variety of cereals, juices, teas, Cafe Cielito Sur™ grown and roasted in our homestead are always available as well as seasonally fresh fruit, home-baked breads, homemade jellies and two daily gourmet main course. For lunch and dinner, you will find several restaurants in Volcan or Cerro Punta. At check-in, we provide our guest with a local map which lists our restaurant recommendations, how to get to the parks and other of the area's attractions. Is there public transportation near the inn? Buses run every 15 minutes from 4:30 AM until 6:45 PM. You can catch the bus right in front of Cielito Sur B&B Inn. The bus fare to the town of Volcan is $0.85 (approx. travel time 25 mins. ), $0.50 to the town of Cerro Punta (approx. travel time 15 mins.). Taxis are widely available. Taxi fare to the town of Volcan is $4.00 (approx. travel time 15 mins.) and $2.00 to the town of Cerro Punta (approx. travel time 10 mins.). What is the temperature in your area during the day and at night? At an elevation of 1,700 meters (5,577 feet) temperatures range from 25° C (78° F) during the day to 9° C (48° F) at night for a comfortable stay. Cielito Sur B&B Inn is often a destination for couples wishing to get away for a celebration or a romantic weekend, and the quiet we provide is most appreciated by adults. Although we are very fond of children, we feel that as a courtesy to our guests, we can only welcome young people 12 and older who would feel comfortable in a grown-up environment. If you have children younger than this, please plan a visit with us as a getaway. It will enable you to appreciate the exuberance of your children when you return home refreshed! Are pets allowed at the Inn? 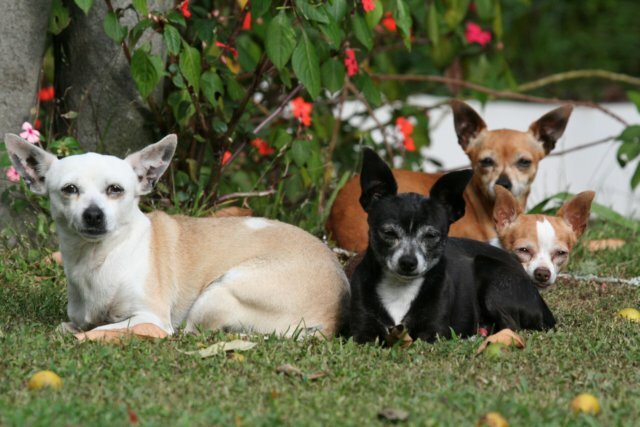 Because we have "Inn Dogs" (Chihuahuas) we cannot accommodate guest pets. Why stay in a bed and breakfast? A bed and breakfast is generally known as a private home where a guest is provided a place to stay for the night. Breakfast is usually included with the price of the room. Most bed and breakfasts are owned by the innkeepers, who often live on the premises. Typically, staying at a bed and breakfast offers a more personal experience than staying at a hotel. If you choose to, you can interact directly with the innkeeper and other guests, something that isn't always practical at a hotel. At B&Bs, "customers" truly are guests, and it shows. Innkeepers will gladly help you find the best restaurant in town, point you to the most romantic spot in the nearby park, and much more. By staying in a bed and breakfast, you will enjoy the social and cultural benefits of meeting friendly family hosts. We have guests that have gone on to become friends and many return year after year - the bed and breakfast becomes their home from home. To make your stay as comfortable as possible, it is important to consider some of the differences between full service hotels and private family homes that offer bed and breakfast. There are many differences with bed and breakfast around the world. An obvious but often overlooked difference between hotels and staying at private family homes, is that of service; there is no receptionist on duty, so it is vital that the family knows what time to expect you, as they have daily family business to attend and many hosts have other daytime jobs to work around as well. Of course the real bonus to the personal contact of staying at a private bed and breakfast is that you will be staying with hosts who really know the area and can give you the great advice about places to eat, shop and visit. You are staying "en famille" and not at a full service hotel. It's like having a personal guide to your holiday! See "What is a Bed & Breakfast" and the differernt types of B&B establishments. Copyright © 1999 Cielito Sur Bed & Breakfast Inn. All rights Reserved.